Menu, Grinding Area and more! This update is packed with new and neat content. We finished the basic functionality of the new item menu, made progress with the grinding area, added a new type of weather effect and got ourselves a new concept artist! So let’s get to it, shall we? Categories are accessible via the tabs at the top. You can also use Q or E on the keyboard or the right and left shoulder buttons on the gamepad to switch through them. Each categories has matching information panels on the left. Under Consumables you can see your status and your current active buffs (We will get in detail on what buffs are in a later update). 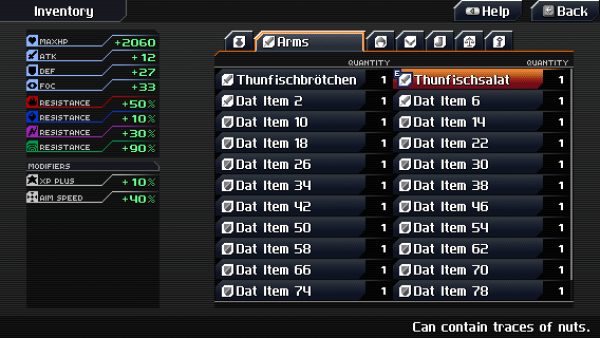 In the tabs that contain equipment you’ll see the status parameters and modifiers of the currently selected piece. 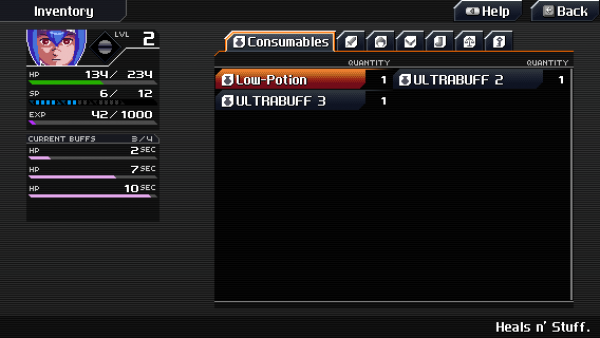 You also notice that your current equipment is highlighted with a little icon, so you can compare the raw parameters of equipment without seeing the difference (as it is in the equipment menu). 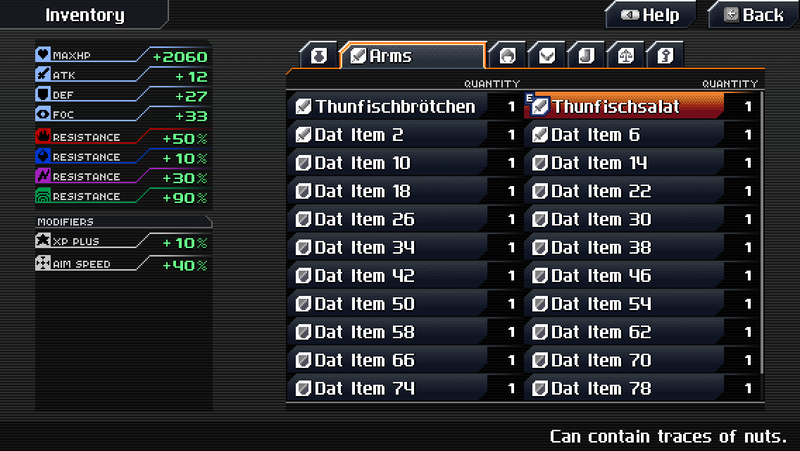 The last two tabs contain Key and Trade items (the latter will also be covered in a later update). What’s missing is an option to sort the items and some of the info panels for the different categories. So there will be some small updates throughout the weeks. But there is another menu coming up which will be my focus for a while. And that menu is the map menu! As the name implies this menu will contain the map of the current area as well an overview of all unlocked areas and the world map. So the upcoming weeks will contain updates on this menu, too. Neat, huh? We’ll continue working on the area by adding more props. Landmarks will also be part of each area to make each place unique and memorable. Felix added a new weather effect to the game: Rain! This effect will be used in various places throughout the game. As you can see, one of these places is the cargo ship. In this GIF you can see more of a gush. But we can also display a dizzle for other areas. In fact we can adjust the rain fairly well to our needs. He is very motivated and already created a bunch of new concepts for us. 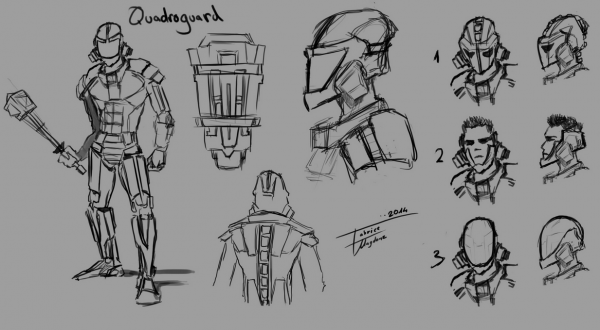 Not only did he create environmental concepts, but also general character designs. Here is a little example of a specific type of character class in the game. He will continue to work with us and probably get his avatar soon as well. So go check out his awesome work! This wraps up this weeks update. See you next time! Are those HP Buffs like regeneration or heal over time kinda buffs, or are they like, max hp+ kinda buffs. Game’s looking really good so far and better with each update. Is there any release date set? Even if it’s as rough as this year or next. Keep up the good work! Really looking forward to this game. Yeah, I also anticipate the moment where they’re done with game engine related stuff and focus entirely on new content! We have the very abitious goal to release the game at the end of the next year. This might long but since we develop and RPG and these take some time. Hopefully we can pull this of, together with the crowd funding event. Wow, the Grinding area really reminds me of Velsarbor (man, that game haunts you)! But the rain effect is really interesting. Will you add other effects later on? Keep at it, I love your project! Yes, we will add more effects as we need them! thanks, can’t wait or did you mean wanted as not coming but was supposed to be? we 100% will release a demo at the end of this year… maybe we have to push it back for another month, but it will come! As Kros said, we plan to release a new (kickass) Demo at the end of this year. We currently working hard to achieve this goal. The TechDemo was as you said just a prove of concept and our way to ask the people if what we do is even interesting. But with the first real demo you will get all the new stuff we added. Will there be different language versions of the game, or only English? The Grinding Area reminds me a bit of Velsarbors Highlands! No, we do not plan to make it open source. There’re a couple of reasons for this. The engine we use (impact.js) is not free even if we changed 90% of it. So we can’t show the code to everyone. 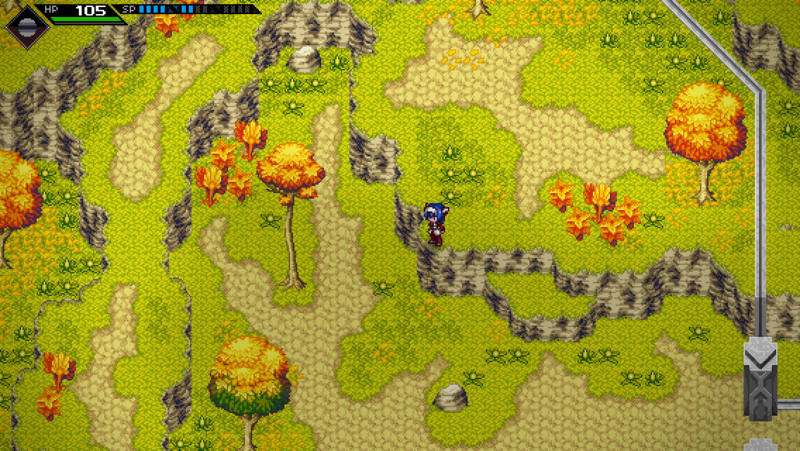 CrossCode is also a game we want to sell when it’s done. 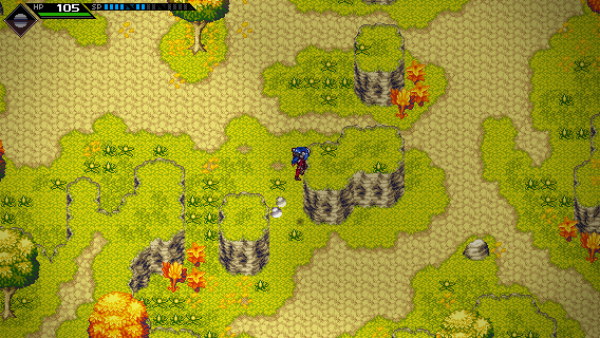 While I can see the appeal in a community driven project, CrossCode is a game that is based on our ideas, with its own story and a set number of features (The TechDemo is really just a proof of concept. Our next demo will include all the RPG aspects you expect!). More cooks will spoil the broth you could say. But we are always happy to answer questions on how create certain features or the like.